We love dolls. Growing up as an only child myself I know that they quickly become your friends. I watch JustaBXgirl with her dolls and know that history is repeating itself. 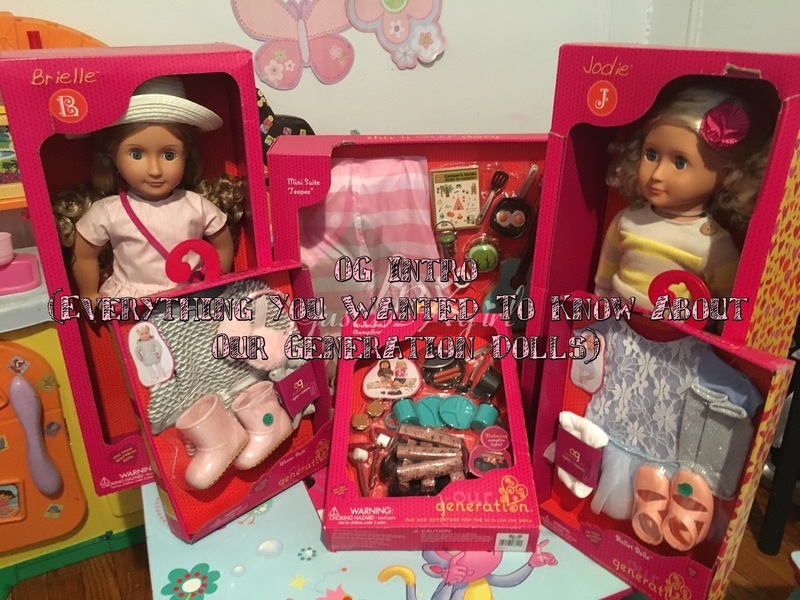 JustaBXgirl talks to her dolls and plays with her dolls and has all types of adventures with them. When I attended HoliDay of Play I was introduced to the Our Generation brand from Battat and I’m wondering how I didn’t already know all about them. The diversity and versatility in these dolls is definitely something I can support. There are five lines of dolls to choose from and trust me you will want as many as you can get your hands on! We received these products for review purposes. As always opinions are honest and those of mine and JustaBXgirl. Trust me, there is nothing regular about these dolls. We have recently had Brielle and Jodie join us from The Regular Dolls Line. Can I say I want both of their outfits??? They are both 18 inch dolls and can be found at Target. And can share clothes with our other 18 inch dolls. These are high quality dolls that will grant your little lots of fun playtime. These dolls all know who they want to be. Each 18 inch doll comes complete with a story book and doll sized accessories to act out the story. How cool is that?! I’m sure your little will come up with their own stories and adventures. I mean I want to play with Coral’s Surfboard. Did I mention that the accessories are in addition to the stylish outfit she already has? These are perfect for all of those littles that love doing hair. These 18 inch dolls come with extra long hair, and hair extensions for hours of up ‘dos, down ‘dos and whatever other styles your creative child can come up with. These dolls really are special. They each have their own thing going on. Some come with hair chalk and different color hair, others come with face paint. You also have dolls like Nicola that are made to be a doctor (she comes complete with x-rays for her patients.) My favorites from this category are the mini dolls. This is where you will find the 6 inch versions of some of your favorite Our Generation dolls. And as if you needed more there are SOOOOO many accessories. We currently have the Mini Suite Teepee set. And yes, I had to specify mini because Our Generation does have the full size teepee for your little to lounge in! The mini suite teepee also comes with a guitar, firefly jar, canteen, compass, skillet, spatula, serving of fried eggs and camper’s guide booklet. These dolls are ready to rough it. But wait, there’s more. We also have the Our Generation Accessories Camping Set. What does that come with you ask? I mean, seriously what else do we need for camping? The camping set includes a campfire, pots and pans, cups, plates and food. These dolls are so prepared. The best part about this line. These are quality products at an affordable price. I know I’m always looking for best deals when it comes to spending my money. Are the the retro dolls the only ones in brown skin tones? Nope, each line has dolls with different skin tones. Have You Checked Out Season 5 Shopkins Yet?